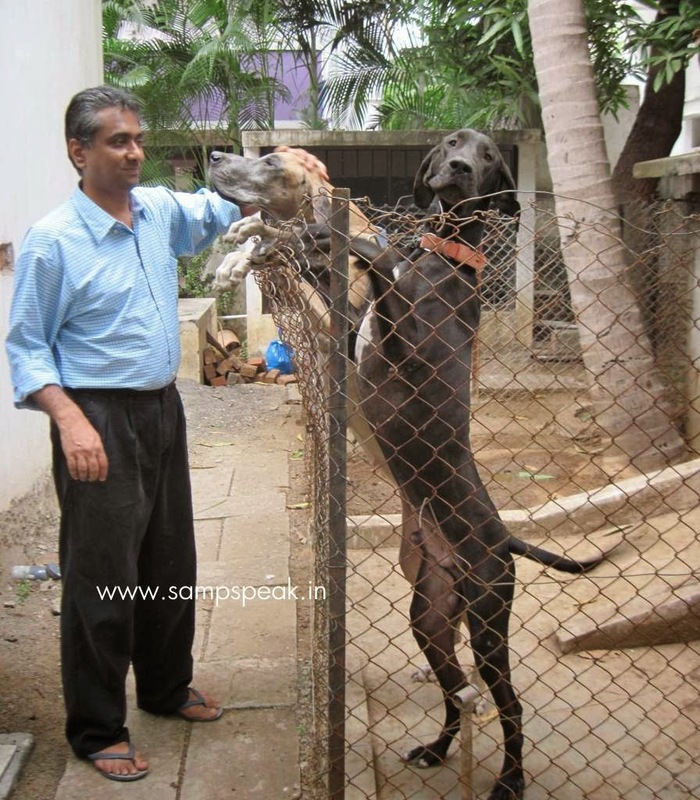 "Sampath Speaking" - the thoughts of an Insurer from Thiruvallikkeni: Freddie, the Great Dane standing at 7ft 4in ... tallest one !! Freddie, the Great Dane standing at 7ft 4in ... tallest one !! What About Bob? ~ is a 1991 comedy film directed by Frank Oz, starring Bill Murray and Richard Dreyfuss. 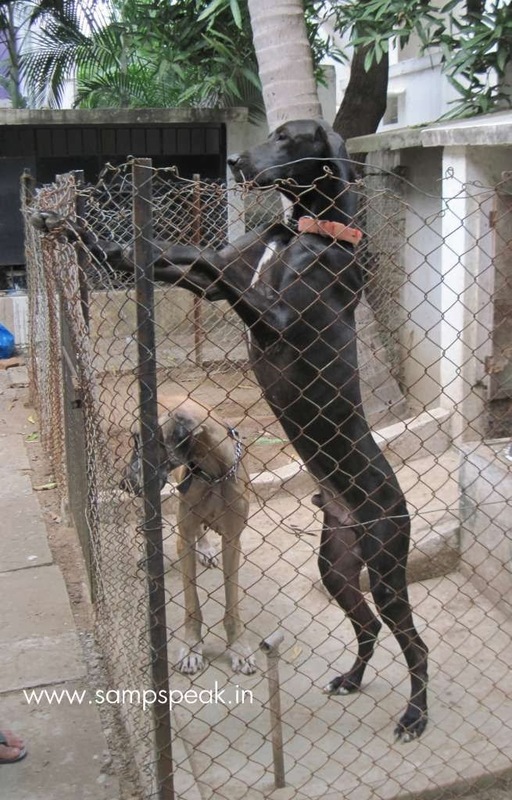 It is a dog’s life… and there are dogs like the subject matter of this post standing at 7ft 4in which gets cared in a great manner…. 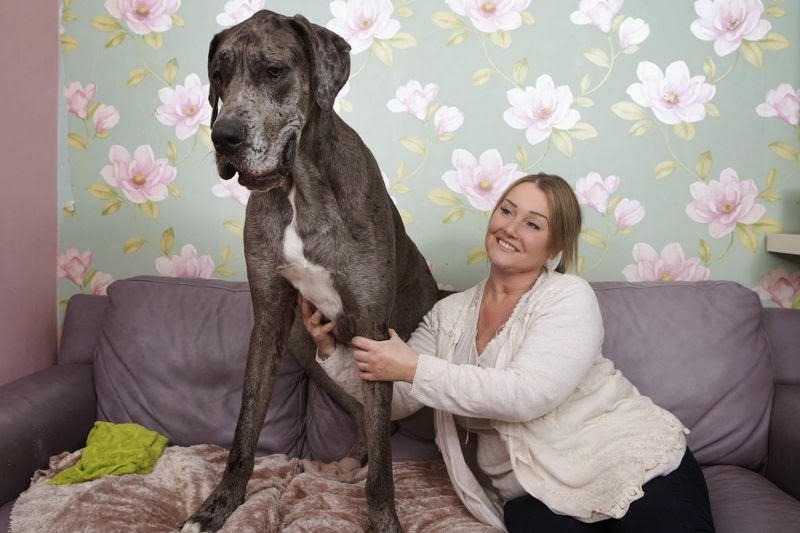 thought to be Britain’s tallest dog, he hasn’t finished growing yet. At 18 months old, he measures 41 inches from his paws to his withers the ridge between the shoulder blades and only needs to grow a few more inches to lay claim to the title of the world’s tallest dog. Dogs - one of the most adored pets – the domestic dog in all likelihood is the first of the animals to be domesticated and used as companion in hunting in earlier days. Dogs are touted to be very loyal to its masters and are stated to be man’s best friend. The other day I was frightened by a tall dog [Great Dane] (not that I require such a tall dog to be cowed down) … the pug is a small breed of dog with a wrinkly, short-muzzled face, and curled tail, made popular with the Hutch - "Wherever you go, our network follows." Dogs can be scary especially when they chase you (in the late hours of the day)… there are many dogs loitering on roads – free ranging dogs that are not contained. There have been reports of them attacking persons and children. They are known to attack and cause harm to other animals as well. There is always lurking fear that the victim needs to be administered ‘series of injections around the stomach’. I read that this is no longer the case and that vaccines such as Nervous tissue vaccine (NTV) are administered. The Great Dane is a German breed of domestic dog (Canis lupus familiaris) known for its giant size. The name of the breed in Germany is Deutsche Dogge (German Mastiff). They are known for their enormous bodies and great height. The Great Dane is one of the world's tallest dog breeds; the current world record holder, measuring 112 cm (44 in) from paw to shoulder, is "Zeus". Their large size belies their friendly nature, as Great Danes are known for seeking physical affection with their owners. Relaxing imperiously on the sofa, Freddy the Great Dane leaves no room to doubt who is top dog in Claire Stoneman’s home. 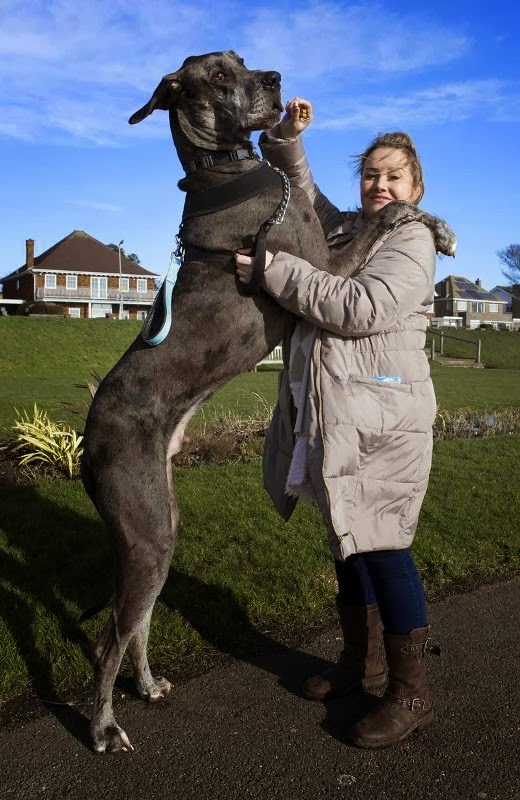 For at 7ft 4in standing on his hind legs, he is thought to be Britain’s tallest dog – and he hasn’t finished growing yet. At 18 months old, he measures 41 inches from his paws to his withers (the ridge between the shoulder blades) and only needs to grow a few more inches to lay claim to the title of the world’s tallest dog. The Guinness World Record is currently held by Zeus, a four-year-old Great Dane from Michigan, US, who is 44 inches tall – the size of a donkey. As for Freddy, he now weighs 11st 2lb and costs £75 a week to feed on standard dog food. Unfortunate to the owners, as a puppy he also had a taste for sofas – and demolished 14 before realising quite how comfortable they are. Miss Stoneman, 38, from Leigh-on-Sea, Essex, said: ‘I’d come home and find a sea of foam across the floor. But he’s my baby and I can’t imagine life without him.’ She even gets up in the small hours for his daily 40-minute walk – so they won’t meet other dogs who might be intimidated by him. ‘If he wants to run after a dog I wouldn’t be able to stop him,’ said Miss Stoneman, who is 5ft 4in tall. In stark contrast, the world’s smallest dog is a Chihuahua called Miracle Milly, who is 3.8in tall, weighs 1lb and sleeps in a doll’s crib. PS : In the film - What About Bob? Bill Murray plays Bob Wiley, a psychiatric patient who follows his egotistical psychiatrist Dr. Leo Marvin (Dreyfuss) on vacation. Yes Bob has multiple fear disorder. The Tamil version ‘Thenali’ directed by KS Ravikumar with dialogues of Crazy Mohan and with Kamal on the lead role was a hilarious comedy… it was about the man who fears everything.